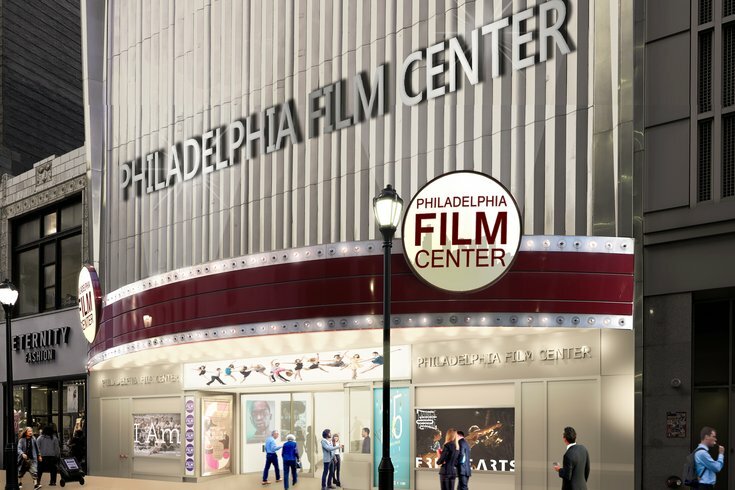 A rendering of what the Philadelphia Film Center's new outside marquee will look like. For many years, Center City had no signature movie theater. By this time next year, it appears, it will have two. The Philadelphia Film Society announced Tuesday that it will transition the Prince Theater into the Philadelphia Film Center. The name change will take place immediately, in time for the annual Philadelphia Film Festival starting Oct. 18. Starting in 2019, the venue will drop all non-film programming, and extensive renovations are planned for the future. The Prince, at 1412 Chestnut St. in Center City, has been a theater since the 1920s, and hosted most local movie premieres throughout the 20th century. Used for all sorts of different performances, the theater has been called the Prince since 1999, and the Film Society bought the building in 2015. According to Film Society Executive Director Andrew Greenblatt, the name change came from discussions among the society's leadership. "What do we want this building to be, and how can we get there?" was the question asked, Greenblatt said. "We need to be showing film, and that's our mission, and having a building that's outside our mission wasn't working for us anymore." 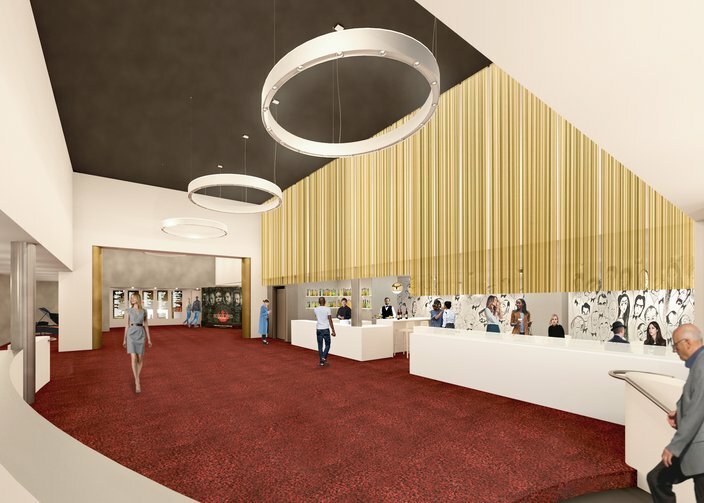 A rendering of what the lobby will look like at the new Philadelphia Film Center. According to Greenblatt, the name change will take place right away, with the next step being a renovation of the lobby, although the lobby's iconic Al Hirschfeld mural will remain. The Society has ambitious plans for further renovations, including the addition of 4K and 70mm projection, as well as Dolby Atmos surround sound to the venue's main auditorium. PFS also plans to switch its Black Box space to an "Education and Community Screening Room," as well as a pair of "VIP micro-theaters," in the former top floor rehearsal space, which will bring the venue's number of screens to four. Such renovations will require further fundraising, Greenblatt said. Beyond that, the new Film Center will add new programming, including thematic festivals throughout the year, in addition to the annual Philadelphia Film Festival and the PFS Springfest, which debuted this year and will continue in the future. 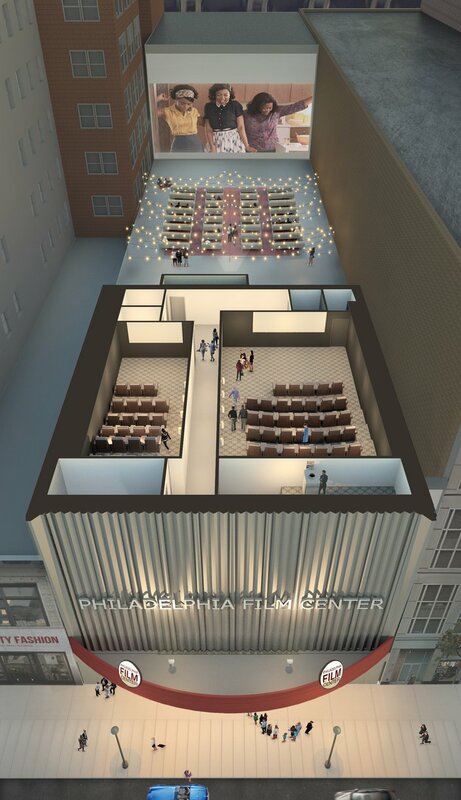 When completed, the Film Center will join the new AMC multiplex in the Fashion District Philadelphia complex, currently under construction on East Market Street, with an opening date (for now) of fall 2019; the Film Society also owns and operates the PFS Roxy theater on Sansom Street. So, after years of Center City being essentially a movie screen desert, things are about to improve for local cinephiles. An aerial view of the Film Center. The name change to the Philadelphia Film Center was announced along with the lineup for the 2018 Philadelphia Film Festival, which opens Oct. 18 and runs through Oct. 28, with most major showings taking place at the Film Center. The 27th Philadelphia Film Festival will open Oct. 18 with the addiction drama "Ben is Back," which stars Julia Roberts and Lucas Hedges. It will close Oct. 26 with "Teddy Pendergrass: If You Don't Know Me," a documentary about the late, Philadelphia-born soul legend, which will be followed by a special musical performance. Other "Centerpiece" screenings include Joel Edgerton's "Boy Erased," Ashgar Farhadi's "Everybody Knows," Jason Reitman's "The Front Runner," Peter Farrelly's "Green Book," Barry Jenkins' "If Beale Street Could Talk," Alfonso Cuaron's "Roma," Steve McQueen's "Widows," and Paul Dano's "Wildlife." Edgerton, Reitman, and Dano are confirmed to appear at the festival with their films. Also showing at the festival is "The Upside," the locally shot film starring Kevin Hart and Bryan Cranston, which has been on the shelf for more than a year due to the Weinstein Company bankruptcy, and will have its local premiere ahead of its release in January. And a film that has been on the shelf even longer, Orson Welles' "The Other Side of the Wind," will show as well.